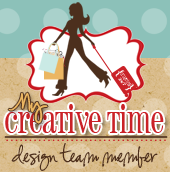 Welcome to another fabulous 3D Wednesday here at My Creative Time! Today, I am bringing back some oldies but goodies using some of my favorite MCT stamps! 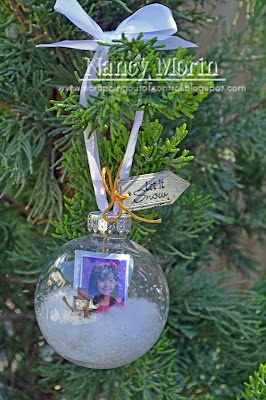 I bought this clear plastic ornament from my local Michaels and created this one of a kind keepsake for our family tree. At first I thought it looked a little childish but the point of making these ornaments are for our kids right? So I was happy with the way it turned out! And did you see the little snowman inside??? How cute right? The snowman is from the "All Around Christmas" stamp set. My sentiment is from the "It's A Magical Season" set. I put pillow stuffing inside the ornament and then sprinkled diamond dust on it. I glued the photo to a wooden stick and rolled it inward to fit inside the ornament. (Not an easy task). I added the snowman to the photo before I added the photo. Sorry about the glare. Thanks for stopping by today and make sure you visit the rest of the design team for more inspiration! Big Crafty Hugs! This is adorable, Nancy! I love the idea of putting a picture inside - what a great keepsake! Your ornament is amazing and so sweet. I was amazed upon reading your how to and how you accomplished this...unbelievable and you are right that ornaments are for kids big and small...love what you did!!! Nancy ~ this is NOT childish at ALL! I never thought about putting a picture in it!! I LOVe this! First your daughter is a CUTIE!! CUTE idea to add the snowman and that snow!! I am trying my hardest what you attacked the picture with inside?? I will email you shortly! LOL! Okay now look how you did your ribbon to hang the ornament with! I must change mine now! LOVE that too! Awesome job!! What a clever idea to put a picture in. 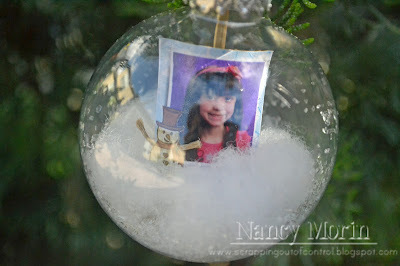 What a way to remember how the kids looked when you hang these on the tree the next year! I LOVE your image ornament! It's perfect for anyone! And that snowman and teeny tag are adorable...not to mention the picture is beautiful! so cute Nancy! oh my I almost made one of these too! that would have been so funny since Kim did too! I love that you put a picture in it! Very cute and not childish at all! I think it is a great family heiloom for your tree!! 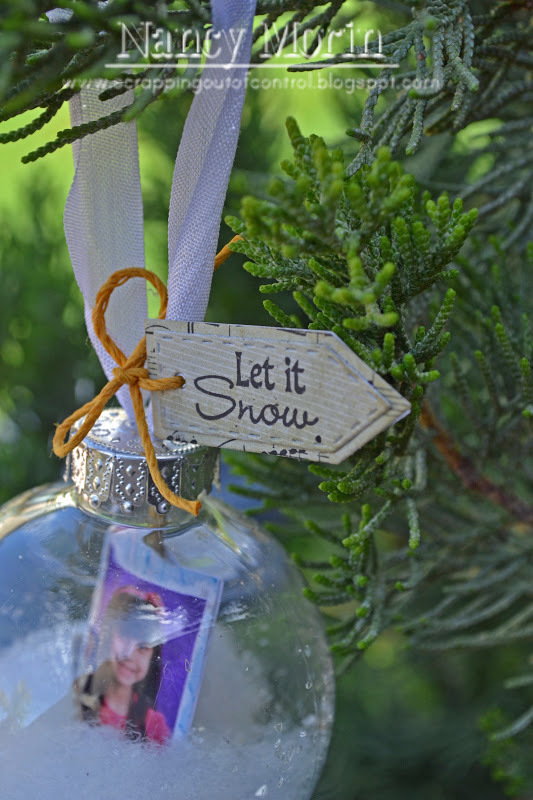 Your ornament turned out so pretty! I like the stuffing in the bottom and adding the little snowman is such a cute idea. Great job!